Dear Readers, Bank Exam Race for the Year 2018 is already started, To enrich your preparation here we have providing new series of Practice Questions on Reasoning Ability – Seating Arrangement.Candidates those who are preparing for SBI Clerk and IDBI Executive 2018 Exams can practice these questions daily and make your preparation effective. 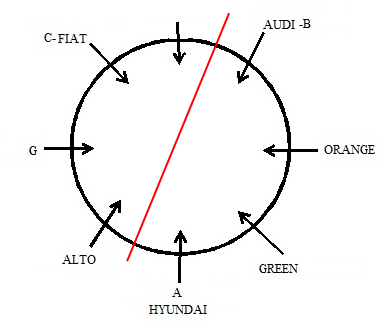 There were two persons between A and the one who likes Fiat car. G sits second to the left of the one who has Hyundai car. Only one person sits between the one who has Audi car and the one whose car is in green colour. 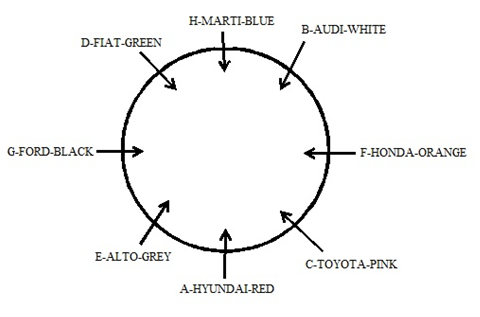 E does not have blue coloured car. The one who has black coloured car sits opposite to the one who has Honda car. The one who has Alto car sits third to the left of the one who has orange coloured car. C sits opposite to the one who has green coloured car. The one who has white coloured car sits third to the left of the one who has Ford car. The one has Hyundai car sits third to the left of B. D sits opposite to the one who has pink coloured car. 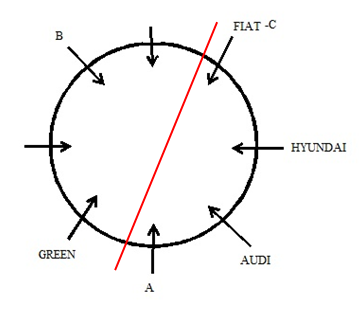 The one who has Audi car sits second to the left of the one who has Fiat car. H does not like orange coloured car. 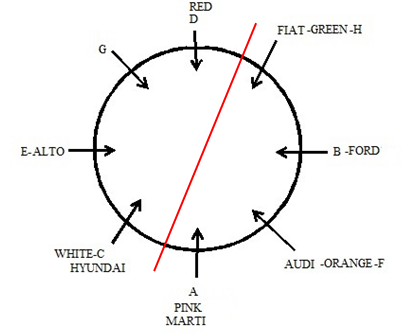 The one who has Maruti car sits to the immediate right of the one who has white coloured car. 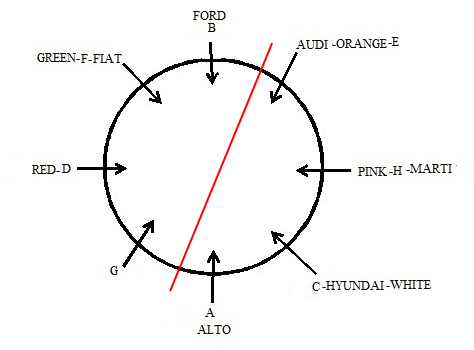 The one who has Ford car sits second to the left of the one who has red coloured car. 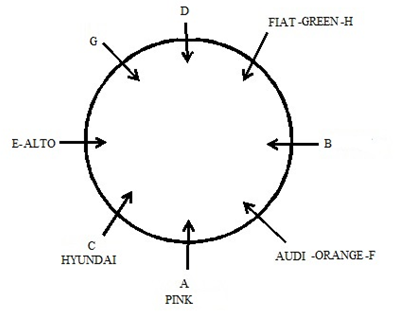 The one who has orange coloured car sits opposite to G. The one who has pink coloured car sits second to the right of the one who has Alto car. C do not have Alto car. 1. G likes which of the following colour? There were two days gap between A and the one who likes Fiat car. 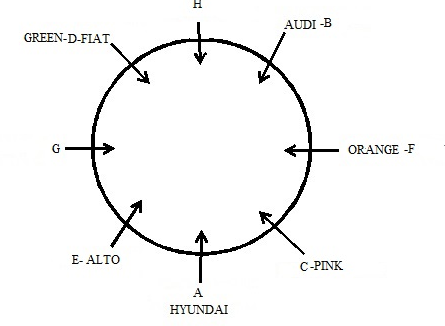 The one who has Audi car sits second to the left of the one who has Fiat car. Only one person sits between the one who has Audi car and the one whose car is in green colour.C sits opposite to the one who has green coloured car. 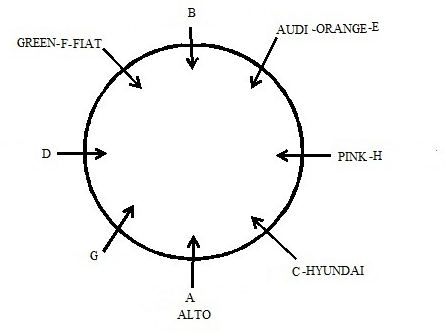 The one has Hyundai car sits third to the left of B.G sits second to the left of the one who has Hyundai car.The one who has orange coloured car sits opposite to G. The one who has Alto car sits third to the left of the one who has orange coloured car.The one who has pink coloured car sits second to the right of the one who has Alto car.D sits opposite to the one who has pink coloured car. H does not like orange coloured car. C do not have Alto car. 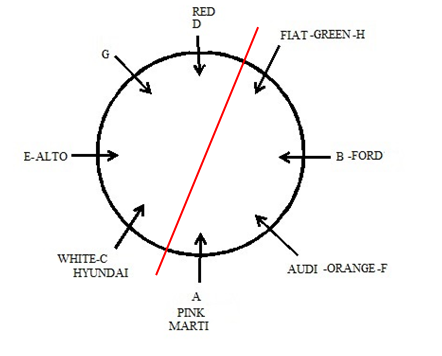 The one who has Ford car sits second to the left of the one who has red coloured car. The one who has white coloured car sits third to the left of the one who has Ford car. 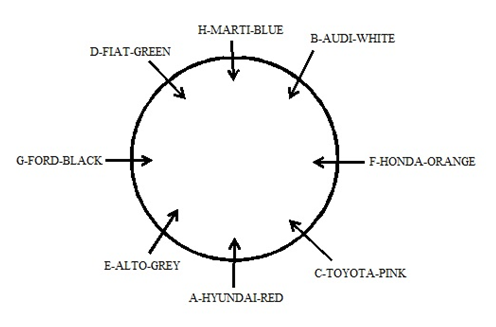 The one who has Marti car sits to the immediate right of the one who has white coloured car.The one who has black coloured car sits opposite to the one who has Honda car.E does not have blue coloured car. 3. What is the position of A with respect to the one who has green coloured car? 4. If H is related to white and F is related to pink then in the same way C is related to? 5. 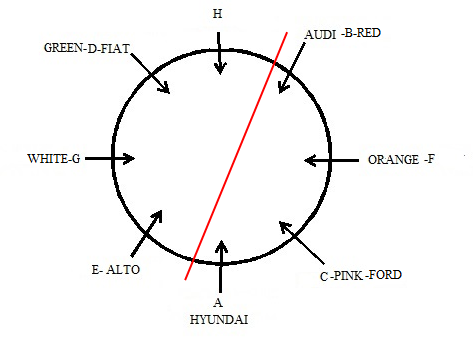 How many persons are there between E and the one who has Audi car? There were eight friends P, Q, R, S, T, U, V and W sitting in a straight line. All of them like different players such as Dhoni, Root, ABde, Faf, Raina, Bhuvi, Smith and Kholi but not necessarily in the same order. They were of different ages 20, 25, 30, 35, 40, 45, 50 and 60 but not necessarily in the same order. No two successive friends sit together according to the alphabetical order. There were four friends facing in north direction whereas the remaining four friends face the south direction. There were three person sits between T and the one who likes ABde. Both T and the one who likes ABde were not at the ends. The one whose age is 45 sits second to the right of the one who likes Faf. There were two person sits between S and the one whose age is 50. W sits second to the left of the one who likes Faf. Only one person sits between P and the one who likes Bhuvi. The one who likes Dhoni sits second to the right of T. R does not sit at any of the ends. Q sits second to the left of the one who likes Raina. The one who likes Smith sits third to the left of W. P’s age is half of the age of W. Only one person sits between the one whose age is 45 and the one who likes Root. The immediate neighbours of T face opposite direction. S sits second to the left of the one whose age is 60. There were two person sits between the one who likes Dhoni and the one who likes Faf. The one whose age is 25 sits to the immediate right of U. The one whose age is 60 sits third to the right of the one who likes Kholi. The one who likes Dhoni faces south direction. The one whose age is 35 sits third to the left of R.
6. Who among the following likes Kholi? There were three person sits between T and the one who likes ABde. Both T and the one who likes ABde were not at the ends.The one who likes Dhoni sits second to the right of T.There were two person sits between the one who likes Dhoni and the one who likes Faf.The one whose age is 45 sits second to the right of the one who likes Faf.W sits second to the left of the one who likes Faf.The one who likes Smith sits third to the left of W.Only one person sits between the one whose age is 45 and the one who likes Root.The one who likes Dhoni faces south direction.The immediate neighbours of T face opposite direction. The one whose age is 60 sits third to the right of the one who likes Kholi.S sits second to the left of the one whose age is 60.There were two person sits between S and the one whose age is 50.R does not sit at any of the ends.The one whose age is 35 sits third to the left of R. Q sits second to the left of the one who likes Raina.Only one person sits between P and the one who likes Bhuvi.P’s age is half of the age of W.The one whose age is 25 sits to the immediate right of U. CASE 2(B): W can’t be 50. If W’s age is 50 then P’s age will be 25. But the one whose age is 25 sits to the immediate right of U. Four of the following were in a certain group, which of the following that does not belong to that group? 9. If P is related to 60 and W is related to 35 then in the same way T is related to? 10. What is the position of P with respect to the one who likes Bhuvi? Q1. G likes which of the following colour? Q2. Which of the following combination is true? Q3. What is the position of A with respect to the one who has green coloured car? Q4. If H is related to white and F is related to pink then in the same way C is related to? Q5. 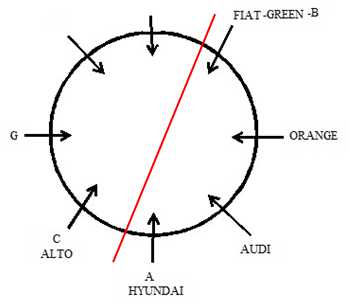 How many persons are there between E and the one who has Audi car? Q6. Who among the following likes Kholi? Q8. Four of the following were in a certain group, which of the following that does not belong to that group? Q9. If P is related to 60 and W is related to 35 then in the same way T is related to? Q10. What is the position of P with respect to the one who likes Bhuvi?